All items being sold as gold, silver, platinum or palladium in the UK must be hallmarked to confirm that they meet the legal standard. This cannot be done by the manufacturer or importer; goods must be submitted to an Assay Office. To find out more click here. The standard Registration fee set by the British Hallmarking Council is £60 + VAT. Registration will last for a 10 year period. Re-registration is £30 +VAT. Your registration is specifically with Assay Office Birmingham. Please note that all UK Assay Offices are independent of one another. Once you have paid the Registration fee, you will receive a confirmation email with a link to fill in your customer details. It is a legal requirement that all registrations have at least one physical punch. 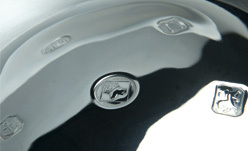 Your punch carries your unique sponsor mark which provides traceability as your initials, set in a shape unique to you, or logo are a compulsory part of every hallmark struck. The fee for a punch with up to 3 initials is £80+ VAT. Once you have paid for your punch, you will receive a confirmation email with a link to specify your punch requirements. On receipt of the form we will review your options and contact you if your preferences are not available, to find you the nearest alternative. A Laser Sponsor Mark is also available at an additional cost for products which are too delicate or complicated to withstand traditional punch marking. This will require the additional set up of laser artwork for your sponsor mark at a cost of £80 + VAT. If you already have a physical punch the set up laser cost will be £50 + VAT. Please contact us if you wish to set up for laser marking. If you have any queries or questions, please contact our Registration Team on 0121 236 6951 or you can contact us here.